Similar features occur on Earth, and have been called “dedos” (Spanish for finger). They have been reported from the Sahara, Mojave, and Namib deserts and are typically formed in hard, fine-grained crystalline rocks, such as marble. 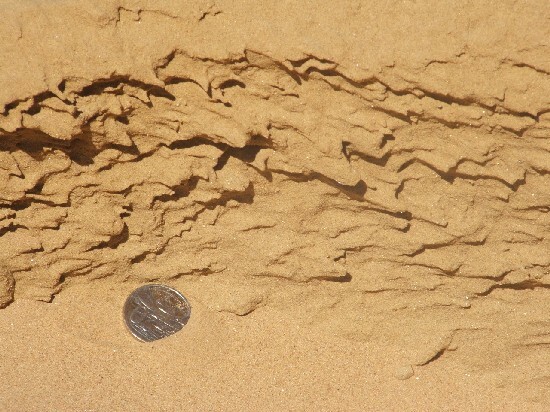 The Perry Sand Hills are a group of active, transverse, source bordering dunes near Wentworth, New South Wales, Australia, adjacent to the confluence of the Darling and Murray Rivers. Small yardangs of older, very weakly indurated sand are found in some swales. Classic dedos reminiscent of those on Meridiani, and also up to one centimetre in length occur on the upwind side of the yardangs (Image 2). Unlike those at Meridiani there is no distinct head to these features and the tips are composed of only slightly more cemented material than the unconsolidated sand which disintegrates back to loose sand with firm finger pressure. Their age is unknown, but it would seem questionable that they would survive a heavy fall of rain. Thus it is possible that they formed over a period of a few months. It is planned to visit the Perry Sand Hills during a field trip prior to the International Association of Geomorphology Conference in Melbourne in 2009, along with other south eastern Australian landforms of interest to planetary scientists. Image 2: Dedos in eroded aeolian sand, Perry Sand Hills, southwestern New South Wales, Australia. Coin is 28 mm in diameter. Breed C. S., McCauley J. F. and Whitney M. I. 1989. 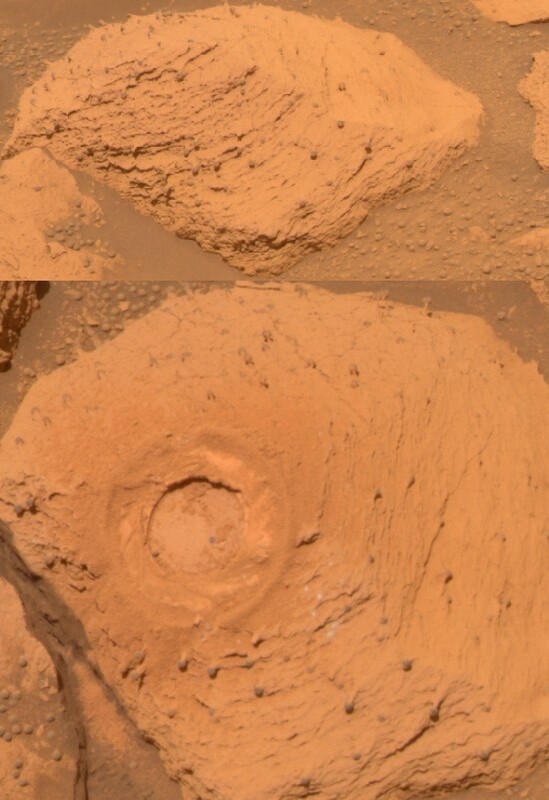 Wind erosion forms. In: Thomas D. S. G. ed. Arid Zone Geomorphology, pp. 284-307. Belhaven Press, London. Laity J. E. 1994. Landforms of aeolian erosion. In: Abrahams A. D. and Parsons A. J. eds. Geomorphology of Desert Environments, pp. 506-535. Chapman and Hall, London. McCauley J. F., Breed C. S., El Baz F., Whitney M. J., Grolier M. J. and Ward A. W. 1979. Pitted and fluted rocks in the western desert of Egypt: Viking comparisons. Journal of Geophysical Research 84, 8222-8232.